Representing Peoria Woodruff High School, Durdle was the medalist of the 1950-51 IHSA Boys Golf State Championship. 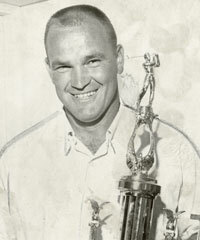 He went on to win the Peoria Men's Golf City Championship in 1952 and 1958 before becoming the head professional at the Peoria Park District's Newman Golf Course. Durdle died in 2001 and will be inducted posthumously..